Following a previously-revealed series of shows in South America, the five-show run will open in Hokkaido on November 21 before stops in Gifu, Okayama, Oaska and Tokyo. Tickets for the Japanese tour will go on sale Saturday, August 4 here. The veteran UK rockers have also added a December 7 concert in Jakarta, Indonesia to the fall series, with presale tickets available Saturday, August 4 before the public on sale on Sunday, August 5 here. 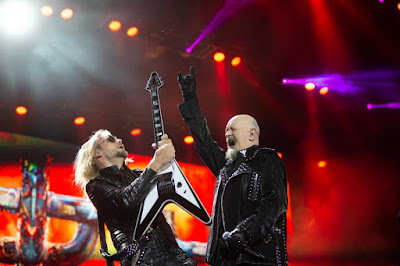 Judas Priest just issued a video for the “Firepower” track, “No Surrender”; the clip sees the band performing the tune in a rehearsal space, where they are joined by guitarist Glenn Tipton, who retired from the road this spring due to health issues from a diagnosis of Parkinson’s Disease. Currently on the road across Europe, Judas Priest will return to North America to team up with Deep Purple for a series of shows that will begin in Cincinnati, OH on August 21.